“It's all connected” was a phrase that was heard a lot during the second half of season one. * Jane Foster got mad because Darcy called the police. London Police would call federal authorities. Federal authorities would call S.H.I.E.L.D. and S.H.I.E.L.D. would “Area 51” everything. * In the follow up episode of Agents of S.H.I.E.L.D., Coulson and company was “Area 51-ing” everything. It was obvious that Thor: The Dark World and Agents of S.H.I.E.L.D. took place in the same universe, and the follow up episode (The Well) expanded the MCU nicely. But the actual tie-ins? The question is: did they need to be? Well, we'll talk about The Well in the next article. But for Thor: The Dark World, it made sense. It didn't take place over a long period of time, and the characters were specifically trying to avoid S.H.I.E.L.D., which was understandable after what Coulson tried to do in the first Thor movie. So my next question: how is this movie holding up? Everyone's talking about how Guardians of the Galaxy caused the MCU to go cosmic, but Thor and Thor: The Dark World took us there first! Are the Thor movies meant to be forgotten by all except the super-completionist fans? I don't know. 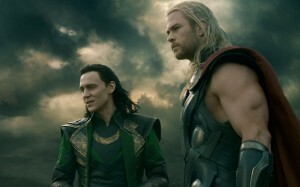 I do know this: I like Thor: The Dark World more every time I watch it. I was actually glad that I included this movie in my season 1 rewatch, even if it all it did for the Agents of S.H.I.E.L.D. side of things was remind me how little it connected to the meat of the show. In the broader MCU sense, rewatching it continued the trend upward of Thor: The Dark World in my opinion about it. I still take issue with elements of the plot that were just too convenient and coincidental. “The story needs X, so the story gets X!” But I still found myself enjoying it even as some of these story annoyances pop up. I hope so. I hope Guardians of the Galaxy doesn't take the wind out of Thor's sails. We need to see Thor and his supporting cast in one more go-round. What about you? Does Thor: The Dark World hold up better or worse since you first saw it? Sound off below!